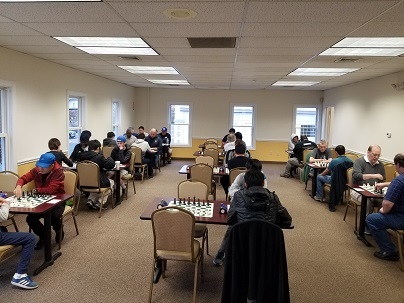 This year’s Fairfield County Open was one of the strongest yet with six Grandmasters and thirteen other masters forming over half of the field. Up for grabs was $2,000 in guaranteed prize money. With a time control of 10 minutes per player with no delay, it made for some heart pounding action and unexpected results. GM Maxim Dlugy led the way with a perfect score after five rounds. 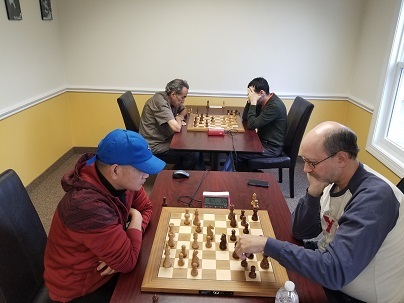 However, in round six he faced the top seed, GM Aleksandr Lenderman. Lenderman, who had suffered two draws earlier in the tournament managed to defeat Dlugy to tie for first. 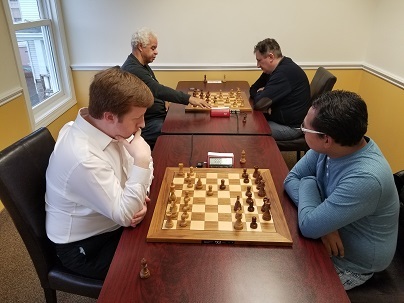 After his round six win he proved to be simply unstoppable, notching five straight wins to earn clear first with a final score of 8/9! Lenderman earned $500 for his efforts. GM Dlugy finished just behind with 7.5/9. Tied with him was FM Hans Niemann who notched several wins against GMs to share second. Each player earned $250. 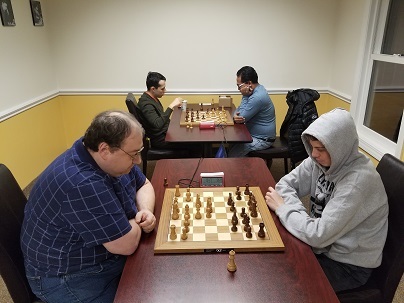 National Masters Ian Harris and Zachary Tanenbaum scored 6/9 to split the $200 U2400 prize. Mario Rebano (2094) had arguably the best performance of the event. He also scored 6/9, easily earning the $200 U2200 prize by a full point margin! The U2000 prize was split between Slawomir Naumowicz and Mitch Fishbein with 4.5 points each. Robert Chen and Benchly Buccat also finished with 4.5 points, winning the top U1800 $200 and U1600 $200 respectively. Traditionally CCFC owner Melvin Patrick gives out prizes before round 9 to recognize new players to the club, long time participants, and the first players to register in each category were also given small gifts. This year was no exception and many players left with various custom CCFC merchandise. As always, thank you to everyone that came out to participate! We are already looking forward to another exciting event next year!